Alewel's Sausage and Cheddar Cheese wrapped in homemade dough and baked. We make all our food from scratch on premises daily, which means we work in small batches. Would you like a large quantities of our baked goods or coffee to go? Is there a specific muffin, scone, or cinnamon roll? No worries, just place an order, and for most of our baked goods we can have it for you or deliver it in the Warrensburg city limits for a $5 delivery fee. .
We have a minimum of $10+delivery fee on all deliveries in the city limits. Most orders can be made in 24 hours, but to guarantee your specific order and delivery time we need a 48 hour notice. Contact us to see what we can bake for you! Thank you! We will contact you as soon as possible to confirm your order. Please note that you order is NOT confirmed until we contact you. Please allow 1 Business day. Looking for space for a meeting? We have a semi-private back room that can accommodate 15 people. The room is free during business hours Monday-Saturday 6:30 am-5 pm, just call in advance to let us know you would like to reserve it. Are you looking for a cute space downtown for your baby shower, bridal shower, or just a fun gathering? Rent out the Old Drum Coffeehouse and Bakery for your event. We might be available from 5pm-Midnight Monday-Saturday and select Sundays for $20/hour. Rental comes with access to all our espresso bar and we can also prepare batch brew coffee or tea if desired for and extra charge. There are options for baked goods to be made for the event but we require the order to be placed ahead of time. We also allow outside food during these events. We do not have the option of allowing alcohol in our shop. For these events we need a months notice. Please call us to request a space reservation. First off, I would like to introduce myself and thank you for taking the time to look at this website and learn more about it. My name is Matthew Cowan. Most people call me Matt. I am a graduate from the University of Central Missouri. I received my Bachelors Degree in Biology. What, you ask made me want to own a coffee shop when I received a degree in Biology? The answer would be you! I have a passion for people and I love to get to know them and hear their stories. I also love to serve people and show them love by providing them with something that they enjoy. So why coffee you still ask? For that, we’ll have to travel back in time to when I was a young child. Some of my fondest memories somehow seem to revolve around the consumption of coffee. As a child, I can remember visiting my grandfather’s farm in the winter around Christmas time. Walking into the kitchen and encountering the warm embrace of the wood stove and family seems to surround my very being. At the same time, when I would take a breath, the sweet aroma of what I can remember to be some hazelnut blend would saturate my soul like a sponge that tries to soak up as much as possible. From this, a love and desire to learn more about this smooth, rich, and bold drink that so many people consume was born. From here, I have countless stories that all seem to revolve around this same welcoming drink. This drink that became such an iconic part of my life is coffee! If you would like to hear more stories, I would love to tell them to you. You just have to come into the store and grab a cup and start making memories of your own. Owner, Matt Cowan Mountain Climbing in Colorado. Are you a coffeehouse and bakery exclusively for dogs? No, we are a coffeeshop and bakery for dog’s best friends (humans). We chose to honor the history of Johnson County and Old Drum in the naming of our shop. 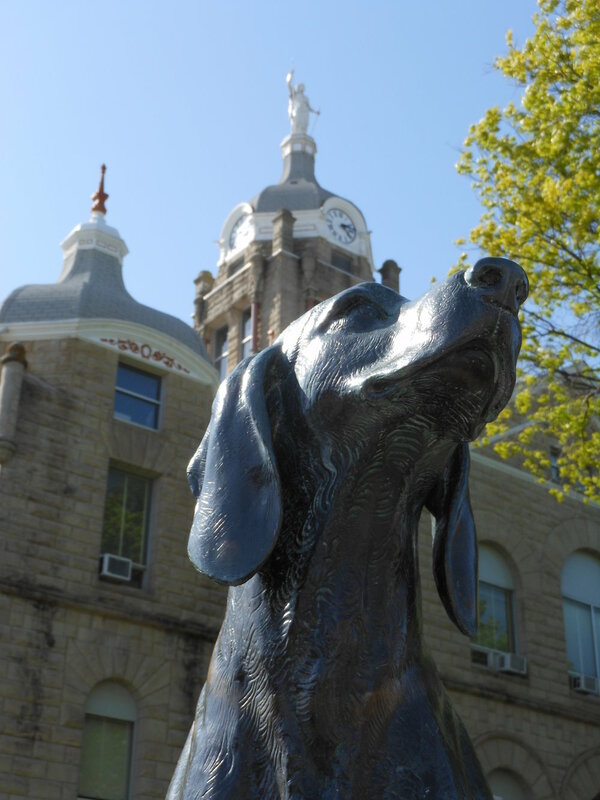 We can also see the statue of Old Drum when we look out our window towards the courthouse lawn. 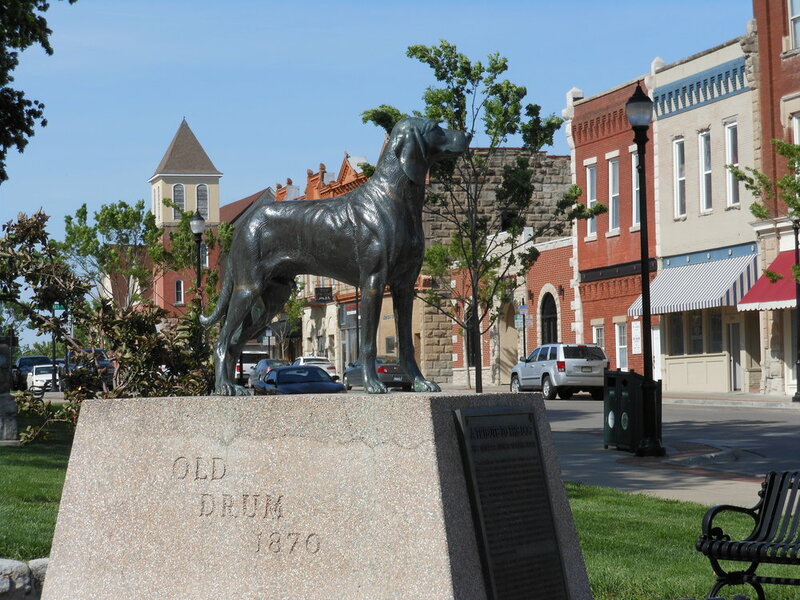 For more information on Old Drum the dog, see our tab above. Do you allow pets in your shop? Unfortunately we cannot allow animals, with the exception of service animals which are always welcome, in our shop due to the health code of Johnson County. Do you have any gluten free or vegan bakery options? Do you carry any non-dairy milk? Currently we offer soy, almond, and coconut milk, along with our dairy options of whole, 2%, skim, breve, and heavy cream. Where do you purchase your coffee beans? All of our coffees are made with beans roasted at Twelve Gate Co. in Sweet Springs, Missouri. Who is Old Drum and why did we name our shop after him? At first the story may not seem overly exciting, Old Drum lived and died over 100 years ago. Old Drum is not just the story of a dog, but for anyone who has had a pet they can call their best friend, it is about great speech writing, and an excellent orator. You can check out the entire background and speech here. Today you can still visit the courthouse where the trial took place along with the Mary Miller Smiser Heritage Library and Museum maintained by the Johnson County Historical Society.